“Excuse me gentlemen, are you from Scotland?”, asked the quietly spoken gentleman overhearing my wife and I chatting together whilst on holiday in Norway earlier this year. “Yes” I replied, somewhat surprised. “Do you know Jim Halcrow from Scalloway?” he further enquired. “As a matter of fact I do”, I answered in complete astonishment. This proved to be the rather bizarre prelude to a most interesting conversation with a distinguished Norwegian accordionist who extolled the fine playing qualities of this son of Scalloway. He was not to know that Jim did not touch an accordion until he was 17½ when, in 1951 he had saved the necessary £22 to buy the second hand Alvari 80 bass from Forbes of Dundee – his first box. He then taught himself how to play it, transferring the self-taught techniques he had previously developed on his mother’s pedal driven American organ. How was it then, that a youngster, who never ever had a music lesson, who still can’t read music and who stayed in the relatively isolated Shetland village of Scalloway was to develop into the musician able to catch the imagination of the likes of the box player from Leirvik in Norway? The teenager of 1951 already had a very keen ear which has not deserted him in the forty years since; rather it has become finer tuned and more discriminating as his eclectic musical taste discarded no tuneful option without a thorough testing. Within a year of picking up the box, he was playing in what was to become Shetland’s top band for the next fifteen years- “The New Players”. The line up included Lollie Young on saxophone, Tammy Cogle on fiddle, Sonny Young on drums and Tom Georgeson on piano and vocals. In later years, the band was supplemented by another young local hopeful on bass, Ron Mathewson, now resident in Ronnie Scott’s Jazz Club in London. The band was in constant demand for dances and functions throughout the islands as well as playing each weekend in the T.A. Hall, Lerwick where they regularly attracted crowds of 400 plus. The band eventually folded after Lollie Young’s health failed and Jim went on to for his own band after guesting with a local jazz group which included Peerie Willie, Drew Robertson and Frankie Sinclair, themselves refugees from Tammy Anderson’s Islesburgh Band. By this time Jim had, after experiencing the vagaries of the construction and fishing industries, decided on a career move and, between 1972 and 1974, took himself off to college in Newark to train as a piano tuner. The box had, of course, accompanied him to England and he was not without offers at the end of his training, but thankfully returned home to live and work. His new line-up had Ian Stewart on electric guitar, Ronnie Hunter on bass guitar and Jackie Sinclair on vocals, with Mitchell MacLeod on drums, and was soon the top band around, resident at the newly opened Lerwick Hotel. Jackie and Ian dropped out, eventually to be replaced by Jim’s pupil, Ian Nicolson on second box and daughter, Hazel on keyboard, as public taste began to demand a return to more traditional music. Presently, son David plays lead box with Jim “filling in ahint” with Brian Morrison (former Senior Scottish Champion accordionist) on keyboard along with Mitchell and Ronnie. Jim’s love affair with Scandinavian accordion music goes back to his earliest days and it has been said that nobody, including the Norwegians, plays a Norwegian Waltz like him, although Jim himself scoffs at the idea. He is, however, a leading exponent of this kind of music and can expect a chorus of requests for it whenever he plays in Shetland. Jim, himself has visited Norway on several occasions, and he and the band had a most successful tour of West Norway in 1978. His guru over the past 40 years has been Norwegian virtuoso, Arnstein Johansen, whom he was eventually to meet in November, 1991 when Arnstein was a guest at the Shetland Accordion and Fiddle Club. And what a meeting it was, over a weekend that took in the traditional breakfast tune in Gordon Jamieson’s Cullivoe home – suffice to say, the two became friends and now correspond. Another hero Jim was to meet at the Club was Jack Emblow, but confesses to being so tongue-tied at the occasion that he didn’t make the best of it. However, if you ask Jim, as I recently did, for his most treasured musical memories, he immediately refers to his tours with his pals in the Hamefarers Band of blessed memory – Willie Hunter, Ronnie Hunter, Jackie Robertson, Douglas Johnstone and, of course, the late, great Ronnie Cooper – we will never hear the like again I fear. How they all enjoyed their playing and the freshness and spontaneity and sheer fun of their performances will certainly live with those of us who remember them. Other such memories include the visits, in the 1960’s of the original Ian Powrie Band and the mega sessions in Hayfield House Hotel in Lerwick (proprietor Frank Chadwick, first Chairman of the Shetland Accordion and Fiddle Club) and the visit he, Willie Hunter and Ronnie Cooper made to the second Mull Festival and first met that other musical legend, Bobby MacLeod. He also fondly recalls the trip to the Lorient Festival in Brittany with Alistair Hunter and the Lorne Band. Not surprisingly, Jim has many requests for tuition from local hopefuls, who would all probably be astonished to learn that Jim himself is still awaiting his first formal lesson. Over the years he has taught many players, the best known of whom include Colin Sutherland, Alan Nicolson, Ian Nicolson and Norma Tulloch, not to mention son, David. Jim remains modest about his composing abilities, dismissing his dozen or so tunes as of little account, but, if pressed, will probably own up to a preference for the fine waltz he wrote to his wife of thirty years, Doreen. A dedicated family man, he was proud to hand over his daughter Hazel’s right hand in marriage to bandleader Craig McCallum in July of this year and looks forward to spending Christmas with them in their new home in Aberdeen. Meanwhile, with his thirty year old Morino IV, acquired from old friend Ian Holmes, he remains as much in demand locally as ever, and his duet playing with David is something else. A large crowd gathered at Scalloway’s big kirk on 26th June to celebrate the life of Jim Halcrow, a testament to the huge respect he commanded throughout the isles; sentiments shared with many people far beyond Shetland. Jim spent his entire life in Scalloway, apart from two years studying at College in Newark. Jim’s life would have turned out very differently had he and wife Doreen heeded the urge to emigrate during the 1950’s. Twenty years later after experiencing the vagaries of the local construction and fishing industries, Jim became a piano tuner. Following his two-year college course, he returned to Shetland in 1974 establishing his own tuning and repair business, turning down offers, which would have meant the family settling permanently in England. It is as one of Shetland’s finest and most enduring musicians that the wider community will fondly remember Jim. In 1951 he scraped together £22 to buy a second hand Alvari 80 bass accordion from Forbes of Dundee and was somehow able to transfer to it the self-taught techniques he developed playing his mother’s pedal-driven American organ. Within a year he joined Shetland’s top dance band of the time, ‘The New Players’. In constant demand throughout the islands for some fifteen years, the band played each Saturday in Lerwick’s TA Hall, regularly attracting crowds of over 400. Jim went on to guest with a local jazz group along with longstanding pal, Peerie Willie, before forming his own band. Resident band at the Lerwick Hotel for many years, their Saturday night dances were sell-outs. They were the busiest band in the isles, many a Shetland wedding was arranged around the Halcrow Band’s availability. Short tours of Orkney and the Scottish mainland were notable musical events, spreading the reputation of Shetland music and musicianship. David assumed lead accordion role in 1992, Jim “fillin’ in ahint” as he put it, on harmony accordion. Daughter, Hazel, also joined the band, playing keyboard before her marriage to Craig McCallum. The band made several memorable ‘TTF’ broadcasts and received rave reviews for their performances at the 2013 Celtic Connections Festival. The Alvari 80 bass had long since given way to a succession of instruments, including the Imperator, Galanti, Crucanelli, Farfisa and, greatly prized, the Morino IV purchased from pal, Ian Holmes. Not as highly prized, however, as the Gola, a 70th birthday present from Doreen, securing his membership of the exclusive Shetland Gola Club. Jim was very fond of Scandinavian music and visited Norway on several occasions. He finally met one of his musical heroes, Arnstein Johansen, the Norwegian virtuoso, during a short tour of Shetland, the meeting developing into a lasting friendship following an almighty music session in Gordon Jamieson’s Cullivoe home. 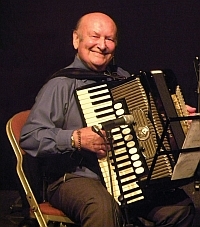 Bandleader Alan Nicolson subsequently joined Jim and David, forming an accordion trio playing a range of Scandinavian and continental music, rapturously received by audiences. Amongst his fondest musical memories were tours with the famous band ‘Hamefarers’ with two of his closest musical pals, Willie Hunter and Ronnie Cooper, joined by Jackie Robertson, Douglas Johnstone and Ronnie Hunter. Their sound had a brilliance and freshness topped off with the excellent musicianship which will long be remembered. Their party-piece opening of ‘Kate Dalrymple’ played po-faced with each player in a different key for the first measure had audiences squirming uncomfortably, laughingly relieved when the band zipped into the second part in perfect tune. The N.A.A.F.C. recognised Jim’s huge contribution to Scottish music in 2012. The Scottish Traditional Music Hall of Fame inducted him into that very select list in 2012 describing him as, “….an international ambassador for Shetland music”. The Jim Halcrow Stadium in Gretna was named in his honour by friend and admirer, Jimmy Norman. Nearer home the Lerwick Old Time Dance club recently celebrated dancing to his music for an incredible 62 years. Jim was above all a family man, his wife of 55 years, Doreen, his constant companion and soulmate. He was quietly proud that his best pal, son David, developed into such a fine musician and delighted when Hazel and Craig married. Grand-daughters Lauren and Lisa, were held in special regard and he cherished the time he was able to spend with them in their home in Aberdeen. As a composer he leaves behind a clutch of fine melodies – the family unsure just how many, as many of them are not recorded on paper. As a teacher his many pupils form part of his great musical legacy – one referring to him affectionately as ‘Sir James’ in the title of a polka he had composed. He was never happier than when playing to a full dance floor; acknowledging dancers with his trademark smile. His relaxed playing style could make the most knuckle-crunching reel flow with as much ease as his slow foxtrots, harmonies always clocked by listening musicians. He had no formal musical education or tuition so didn’t read music, relying on his keen ear, which never failed him. Well-known bandleader, the late Jim Johnstone asked to comment on this phenomenon replied simply, “You either have it or you don’t”. Jim certainly had it and we were privileged to enjoy it.